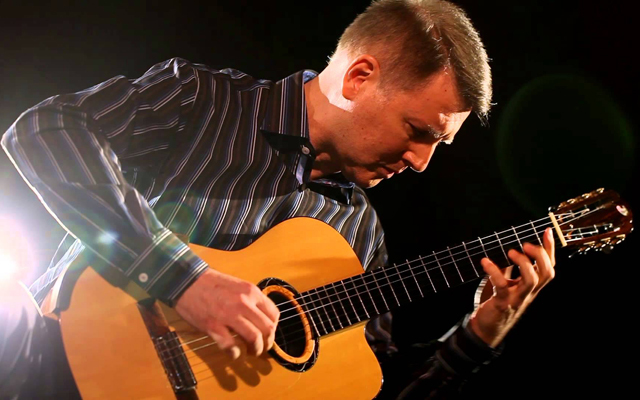 The guitarist Ken Hatfield is, like Wynton Marsalis, equally adept in the realm of Classical as well as Jazz music. Many other musicians may be schooled in both forms of the music, but like Marsalis, Hatfield is a breathtaking virtuoso and – as we have known for some time now – contributed important music to the canon of Classical music. Here we have the latest example of this: 12 Preludes For Solo Guitar. This wonderful disc takes as its starting point the form of those succinct keyboard pieces, stand-alone pieces that Chopin (1810 – 1849) wrote, which liberated the prelude from its original introductory purpose and allowed it to serve as an independent concert piece. Hatfield’s 12 Preludes feature short and long cantabile lines and display gorgeously tinted harmonies. Each successive prelude moves up a fifth from major to minor and Hatfield uses major and minor modes and also cleverly mixes through-composed work with colourful cadenzas. The principle pleasure of these ‘divertissement’ is how a simple conceit is eloquently identified in Ken Hatfield’s logical, inventive and attractive compositions. Since the majority of these pieces are not highly wrought contrapuntal essays, the effect is often a brightly-lit journey through Bach’s early melodic proofs and cathartic figuration to beyond Chopin, Busoni and the impressionistic sojourns of Maurice Ravel. Throughout they are vividly contrasted and convey an exhilarating sweep. Hatfield’s fresh voice and genuine musicality warrant the placement of these 12 Preludes in the vast classical prelude discography’s top tier. In contrast to musical interpretations of preludes in general, which seek unity and continuity through rigorously considered tempo relationships Ken Hatfield’s performance of his preludes aims to reveal each prelude’s individual character. The bubbling, insouciantly rhythmical No. 2 is followed by a profoundly subdued No. 3. The dancing No. 4 is pleasantly lyrical as well and impresses not only as a technical feat but also as an expressive study. The glorious No. 6 recalls Ravel’s Le tombeau de Couperin and is, to my mind the crowning glory of the set of 12. 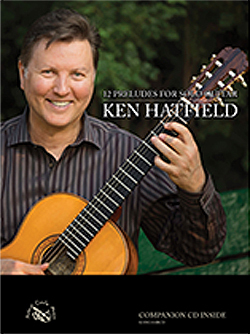 Another factor that unites this entire study is the fact that the technical prowess of the written music is gloriously balanced by Ken Hatfield’s poetry which is offered in abundance throughout the masterful performances of the 12 Preludes For Solo Guitar. This presentation is available in a CD-alone package as well as in a book form with the scores, to joyfully read along with the music, or even practice and play and also includes an excellent pedagogical essay by Hatfield.